For the last 44 years, the sun has shone brightly on Patricia Shaw Crabb and her husband, Gary and the house in Louisville they called home. “We’ve enjoyed our years here, and we had two kids that we raised here,” she said. The husband and wife first met in Cincinnati during college, and it didn’t take long before they were dating. “He was a fifth-year senior in engineering and I caught him as a freshman,” she laughed. The couple married and pursued different careers – Patricia in education, and Gary in engineering before he turned to sales. But 12 years ago, Gary, who was known for his attention to detail, started having trouble remembering the smallest details. He had developed dementia. accommodate his changing needs. But she was also committed to staying with Gary and didn’t want to move to a community that would require Gary to move out if Patricia passed away first, or needed to relocate to receive more advanced care. After three years of searching, Patricia finally received the help she had been looking for. 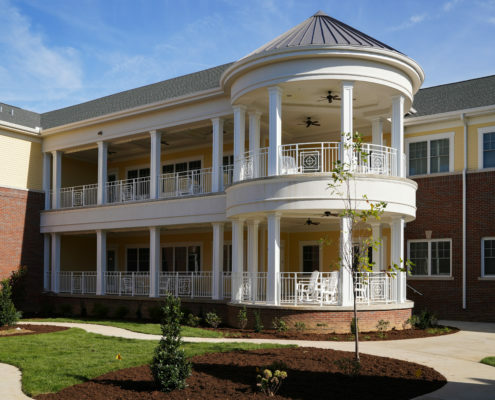 She learned about Grove Pointe Assisted Living at Masonic Homes in May 2018 when she saw a newspaper ad that also mentioned memory care needs. She and Gary stopped later that day to learn more about the new luxury community, which would offer one- and two-bedroom apartments, along with fine dining, activities, transportation, housekeeping and an array of services for residents needing assistance with bathing, dressing, medication reminders and other support. They reserved an apartment and were the first to arrive on August 13, 2018 when Grove Pointe opened–with their two dogs and cat in tow. Their dogs love to greet you at the door, while the cat prefers the solitude and quiet under the rocking chair in the bedroom. Splashes of orange, Patricia’s favorite color, decorate their apartment. The Crabbs were ready to simplify and start a new life together at Masonic Homes, and they are not alone. “We’re seeing more and more people saying, ‘This makes sense. I have everything I need right here’,” said Kacey Hargis, Grove Pointe sales manager. Kacey said there is a wide variety of people living on Masonic Homes’ sprawling Louisville Campus, from those in need of short-term rehabilitation or who need assistance due to a medical condition, to those who are looking to simplify and have help available in the future, should they need it. “You have the security knowing if there’s something you need, all of our team is there to help support you and get you the services needed,” Kacey said. Beyond the spectacular dining experience and numerous activities offered on campus, Kacey said many people enjoy living at Masonic Homes because of the attentiveness of the staff. “That’s why we are here. For anything they may need. It could just be a conversation or concern they are dealing with, but they appreciate our caring support,” Kacey said. Patricia Crabb says that was important when deciding to move to Grove Pointe. Dementia made it challenging for her husband to cook or complete home repairs, but they are now able to dine on campus, and staff members are there to help when they need assistance – even when it is just helping them reprogram their TV. “You’re giving me the tools to keep him calm and happy,” she said. At 69-years-old, Patricia Crabb is not your typical Grove Pointe resident seeking assistance or support. 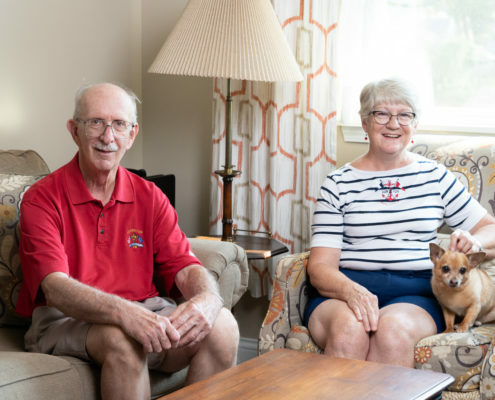 She’s healthy and active but knows her husband, who is 73-years-old, will eventually need memory care with more assistance, which is offered at Pillars Assisted Care Center and Sam Swope Care Center on the Masonic Home Louisville Campus. prepared well in advance. Kacey says making the decision to move to Masonic Homes is always better when the potential resident is able to be part of the decision early on, rather than waiting until an urgent needed arises. “It truly works out so much better when they can be part of the planning of what they want their future to look like,” Kacey said. For the Crabbs, that future includes settling into their new Kentucky home – together.